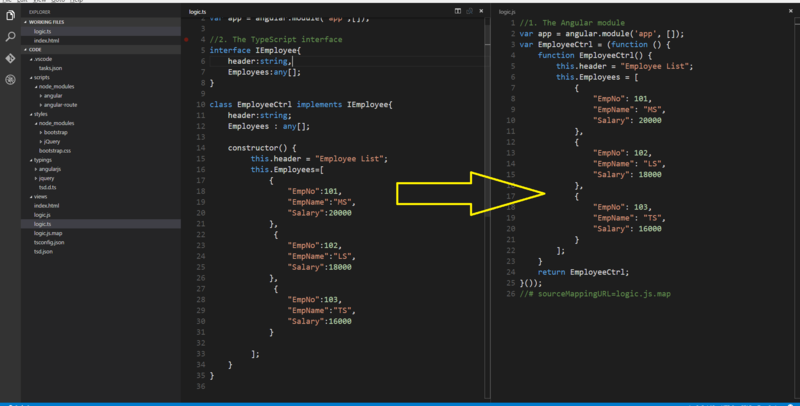 Why TypeScript for AngularJS applications? TypeScript can improve refactoring and quality of angularjs applications. Another point to note in favor of using TypeScript for AngularJS apps is that the next version of Angular (Angular 2, currently in RC) uses TypeScript , so current AngularJS applications developed using TypeScript have a better chance of a smoother transition to Angular 2. To implement our application, we will be using Visual Studio Code and Node.js. 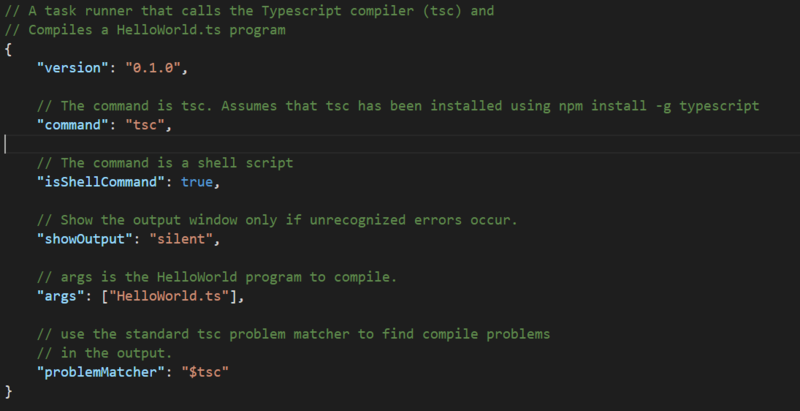 After installing Node.js and Visual Studio Code, we will need TypeScript using the instructions in this link. On Windows OS and with Visual Studio 2013 or 2015 IDEs, we can download project templates for TypeScript from this link. Step 1: Since we need to create a project workspace for our AngularJS application, create a new folder on your hard disk. Open VS Code. Using File > Open Folder, open the folder in the Visual Studio Code to create all files in the same folder workspace. This will install the AngularJS framework and routing library for the current project. Get more information about this file from this link. Replace the “args” value to blank. (Delete HelloWorld.ts). This will install the angular.d.ts file. The –resolve switch will resolve all dependencies needed for angular.d.ts, in this case the dependency is jQuery.d.ts. The project will add typings folder containing angular.d.ts and jQuery.d.ts. It will also contain tsd.d.ts containing references for angular and jquery. The file tsd.json will be added to the project which defines required configurations for these files. 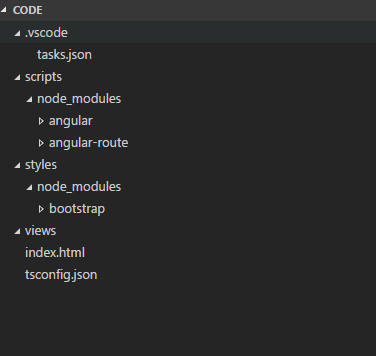 Step 6: In the logic.ts file, we will add code for creating angular module and controller using TypeScript features line interfaces, classes, etc. The interface will define all methods and properties to be exposed to the view for databinding purpose. 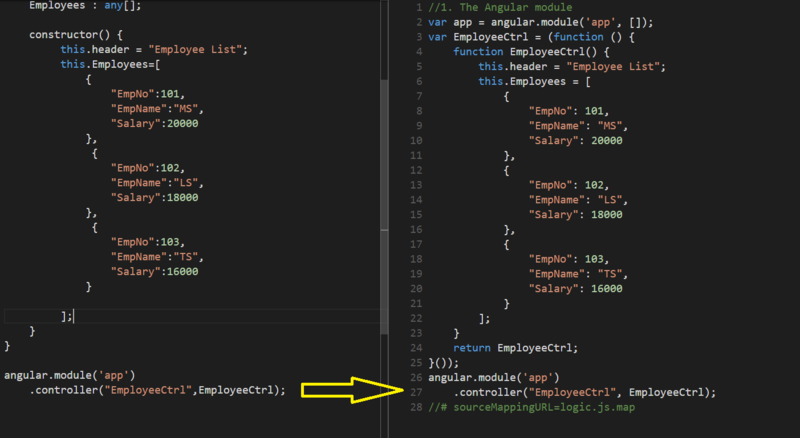 The angular Controller will be implemented using TypeScript class. This class will contain properties, methods, constructor, etc. The Constructor function of the controller class will be used to inject dependencies to the controller. Finally, we will register the TypeScript controller in our Angular module. In the TypeScript interface of name IEmployee, we have declared header property of type string and the Employees array of type any. The any type of TypeScript will allow us to store any type of data on Employees array varying from string to numeric or a JSON object. In logic.ts, add the following TypeScript code. This is the class which implements IEmployee interface and all its properties. The above html markup shows the Angular directive with databinding. This will install the http server. This is a simple zero configuration command line http server and does good in a development and testing environment. The above code adds a new TypeScript class of name Employee with properties in it. The EmployeeCtrl class declares the Emp property of the type Employee. The constructor of this class instantiates the Emp set toits default values. The EmployeeCtrl class implements addEmployee method, this pushes Employee record in Employees array. This modified code has text elements with data bound on them using ng-model directive.